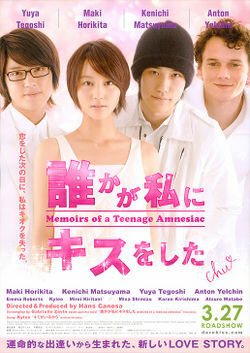 Memoirs of a Teenage Amnesiac is a 2010 drama film based on a book written by Gabrielle Zevin. Naomi (Maki Horikita) is an ordinary high school student who goes to an international school. One day, she loses her memory for the past four years. But gradually she begins to search for her identity, and even when her memory returns, she keeps on looking for her real self, and what she truly loves in life.